“Sprouting Broccoli from Calabria” is a tender variety with a superior taste, and produces plenty side shoots. Compact med sized head. Sow in seed boxes and transplant or direct sow 50cm apart from summer through to spring. Allow 60 –80 days to pick. Small florets will grow back after harvesting. 7g approx 1200 seeds. Friarielli. 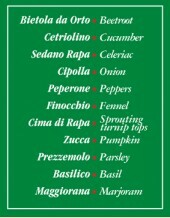 One of the most sought after,iconic and renowned vegetables of Italy. Fast growing,high quality and depth of flavour. Used traditionally on Pizza in Naples with olives and chillior with sausages When you pick the central flower the plant begins to produce side shoots (spigariello) that have tiny florets. Friarielli is sort of a kind of broccoli which is grown also for immature edible leaves.Neopolitans go crazy for this vegetable! 4 gram packet. “The cauliflower of Roma” also called Broccoli Romanesco but Franchi classifies it as a cauliflower. Light lime -green long pointed heads that spiral into a point. It has a sweet nutty taste. Plant in fertile soil in late summer for autumn–winter picking. 4g approx 1000 seeds. ‘The classic Italian eggplant’ Beautiful glossy deep purple hues. Long slightly curved rustic Italian eggplant grown throughout Italy. It is firmer and a little sweeter than other varieties. Use for traditional dishes such as Melanzana alla Parmigiana or warm Moroccan salad with tomatoes and coriander. Good reliable producer in around 70 days. Grow from 8 week old seedlings or direct sow when soil is warm, space 40 to 50 cm apart and provide support. 4g approx 400 seeds. Mid to late variety. The most famous of all Italian red onions and possibly the highest-quality red onion in Italy. This Calabrian variety is very sweet and ideal for making onion paste and for stuffings. Changes from white when young to red in maturity It stores very well in a shady cool room. Sow in Spring and Autumn. 5g approx 1250 seeds. LAST STOCK Franchi Selezione Speciale early very hot variety from Calabria. A cherry chilli pepper with round, red fruit about 5cm in diameter. Quite a hot pepper and previously called “Satan’s kiss”. This chilli pepper has full round flavour to compliment the heat , Use fresh, dry or pickle. Like all peppers start off from Spring in a protected area sowing them 1cm in depth. They must have light and heat at this stage. Italian peppers can take a little longer to germinate . Transplant outside after the last frosts.2.5g approx 300 seeds. An heirloom pumpkin from the seaside area of Chioggia ( key-ohj-jah ) near Venice. Abundant turban-shaped medium-large size fruits that are deep blue-green. The deep yellow orange flesh is very sweet but not sugary,the texture creamy smooth. The deep orange flesh is used for pumpkin ravioli and gnocchi in northern Italy . Excellent storer. 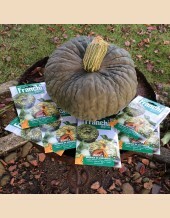 Franchi have provided us with the BEST tasting pumpkin ever! Plant seeds 2cm deep early spring, in hills. 4g approx 13 + seeds. ‘Blackbird’ small brilliant green open-pollinated Spinach which is slow to bolt. Ready for picking in around 50 days. Direct sow autumn and spring and pick when leaves are young and tender. Avoid the heat of mid summer. Holds together well when cooked. #spinach and ricotta lasagna 14g approx 1000 seeds. Broccoli-type turnip tops which you can harvest in 60 days. Mid-early rustic plant producing lots of tender sprouting florets.The flavour is turnipy with mustard overtones. 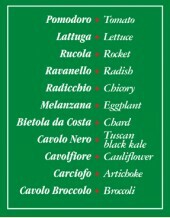 60 day ( and 40) Cima di Rapa can be sown every month for five months from around Feb-June. Ensure you pick before the florets turn yellow and go to seed. Broccoli type Turnip tops. A bitter-sweet taste that Italians love. Use in the well-known pasta dish from Puglia, Orecchiette with turnip tops (cime di rapa) and chilli. A small plant 20 to 25cm high, ready in about 40 days. Succession plant for continuous harvest. Pick as heads form as they quickly go to seed. If left too long it will go stringy when cooked. 15g approx 6000 seeds.